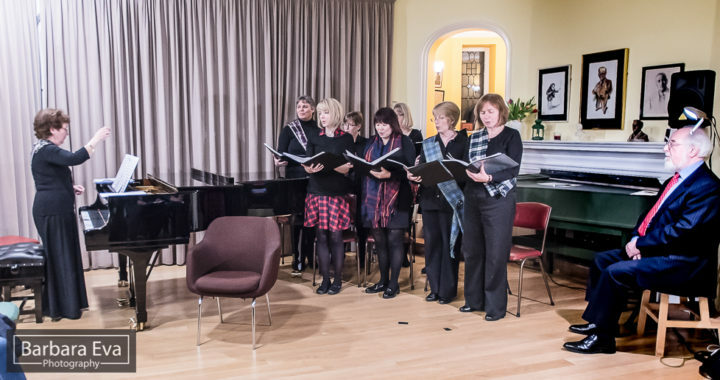 On Sunday 3 February 2019, the audience who filled the main hall of the Edinburgh Society of Musicians had the opportunity to watch a splendid selection of artists performing as a part of the Robert Burns and the Romantics event. The evening started on a strong note with the Queen Anne Singers, conducted by Nancy Crook, singing Robert Burns’ Duncan Grey, and they beautifully performed a number of both popular and less well-known Burns songs (and Jean Elliot’s mournful lament, Flooers o’ the Forest) throughout the evening. There were several more Burns classics, including the hilarious Wille Brew’d, and a chilling rendition of Franz Schubert’s Der Doppelgänger, from the baritone Ivor Klayman. The programme also included poems by the Polish Romantic writer Seweryn Goszczyński and a Silesian translation of Burns’ beloved Address to a Haggis, gracefully read by Kiro Żabińska-MacIntyre, and the Bard’s epic tale of a drunken encounter with a coven of witches, Tam o’ Shanter, performed with gusto by Keith Mullins-MacIntyre. The audience also enjoyed an innovative Polish-English performance of an excerpt from Adam Mickiewicz’s Forefathers’ Eve Part II. It was presented by Lustro SCENY / The Mirror of Stage group, supported by their guests (Paweł Kopeć, Kiro and a group of Cracovian actors: Roland Rajzer, Ewa Chałupa, Katarzyna Stępniak, Małgorzata Wrońska, Łukasz Moskalik whose recorded voices greatly helped to re-create the setting of an old, stone chapel in which the folk ritual of summoning the souls was to take place). The evening concluded with everybody singing two stanzas of Auld Lang Syne and another two of its Polish equivalent. Afterwards the participants were invited to a modest reception. The Scottish-Polish Cultural Association would like to wholeheartedly thank all the performers, sound, light, photo and video crew as well as the SPCA Committee members who helped ‘behind the stage’: without you the event could not have happened. Our thanks also to photographer Barbara Eva for covering yet another SPCA event. Words of gratitude also go to Nancy Crook and the Edinburgh Society of Musicians for all the support around hosting the event and, last but not least, to our faithful audience: we hope that you enjoyed the evening and we will see you again at future events.